It is always important to include colorful and crunchy vegetables in your child’s diet. Vegetables are loaded with essential nutrients which is mandatory for a child’s growth and development. If your child is a fuzzy eater, this is the best recipe to include many vegetables into the appam. Vegetable appam is the best snacks box choice for growing kids. I have prepared this vegetable appam using idli batter, it is a super quick recipe and will hardly take 10-12 minutes. 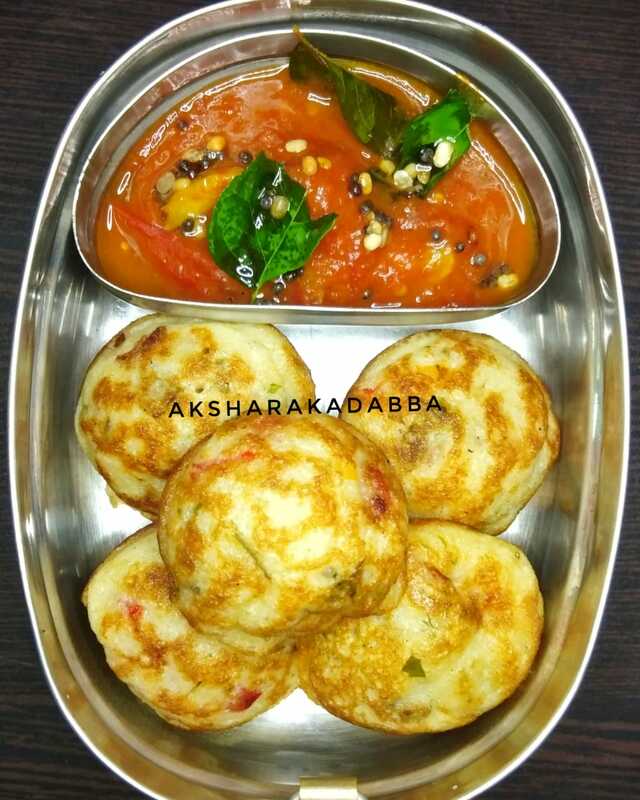 Tomato thokku is the best combination to enjoy yummy vegetable appam. Take a pan, add oil and mustard seeds. Allow it to splutter. Add the onion, asafoetida, and ginger, give it a quick stir, the onions should turn transparent. Add the vegetables i.e. carrots and colorful capsicum. Cook the vegetables in medium flame for 5-6 minutes. The capsicum needs to be crunchy, don’t overcook it. Add the required amount and salt and turn off the flame. Take a medium sized bowl, add the idli batter, curd, and cooked mixed vegetables. Now add pepper powder and jeera powder to it. Check for salt, add if needed. Add the coriander leaves and mix everything well and allow it to rest for 2- 3 minutes. Turn on the flame, allow the appam pan to heat and grease each mold well with gingelly oil. Fill the 3/4 the of the molds with the appam mix and cook for 2 minutes in medium flame. Flip the sides and cook the other side for another 1 -2 minutes. Repeat the steps 8 and 9 for the rest of the batter. You have to cook the vegetable appam until both the sides turn golden in color. Serve the yummy vegetable appam with tomato thokku. You can replace the gingelly oil with regular cooking oil. Gingelly oil gives a wonderful flavor to the cooked appam. You can avoid adding curd, it makes the appam soft and a bit sour hence I prefer to add thick curd to the idli batter. If the idli batter is sour, you can totally skip it. 3. The choice of vegetable and quantity is totally yours. Add colorful vegetable and make the vegetable appam appealing to your little one.